People raved. It became a house favourite. It was pretty good. But this is better. Much better. You can’t rush this rogan josh. No way. Homestyle curries take time. Beef takes time. But it’s time that makes it all come together. This is no different than any other beef stew. You need to go slow. This is a braise. And braising cannot be rushed. It’s a good thing. The house will smell incredible. You will be pleased with what you cook. Browning meat is not about colour. That’s a nice byproduct sure. But it’s about flavour. Depth of flavour. Complexity. There’s this thing called the Maillard reaction that happens when you brown. Basically something wonderful happens when the amino acids and reducing sugars in the meat hit heat. Complex chemistry. Food science. But you don’t need to worry about that if you don’t want to. All you need to know brown is better. Way better. 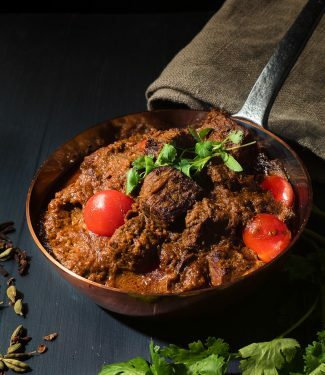 I’ve learned a lot about Indian cooking since I first made this recipe. Indian flavours are big. To get big flavours you need spice. Lots of it. Not necessarily more heat – chili is only one spice in the mix – but more flavour. I’ve also learned that blooming the spices – cooking them in oil up front – makes a big difference. Try that. You will never go back. Browning onions well is another key trick. Cooking onions until they are translucent is good for western food. It is not right for Indian. Translucent is not brown. You want brown. These are truths that apply to all Indian curries. 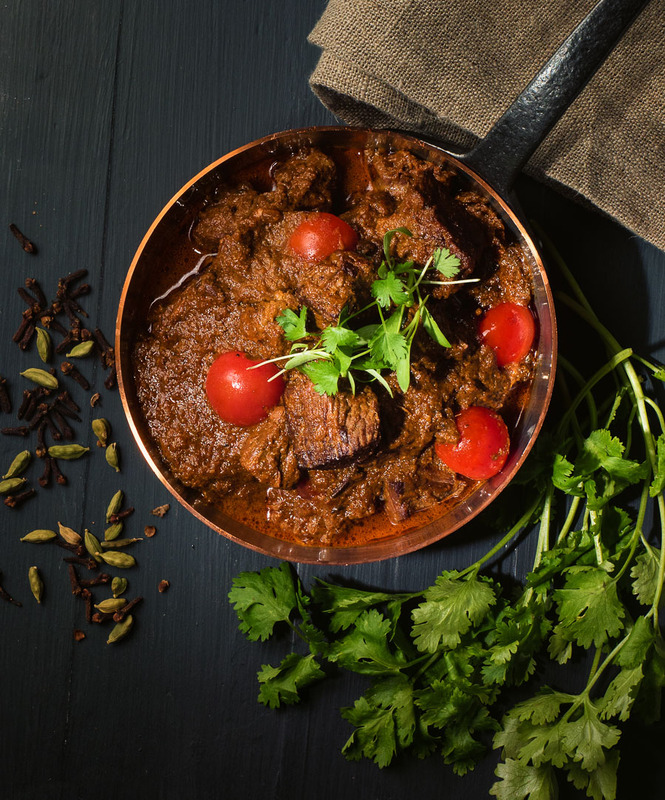 If you like cooking Indian, consider adding these techniques to your cooking. 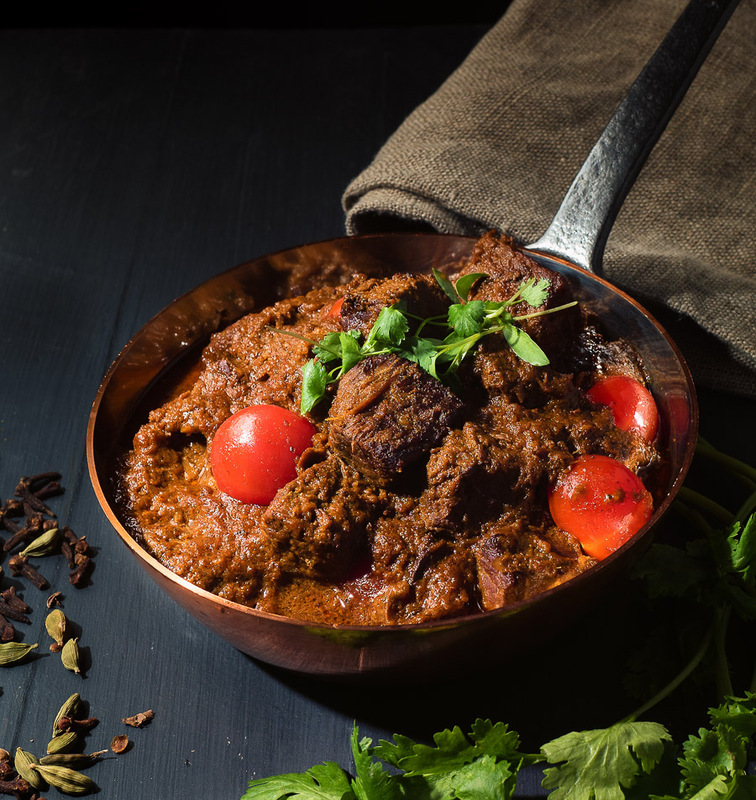 Beef rogan josh is a deeply flavourful, rich Indian curry. The oil is important to bring the flavours together when you fry the spice mix with the onions so don't skimp. You will be spooning most of it out later anyway. Work in batches. Lightly brown the meat in batches. Don't crowd the meat. Leave a half inch around pieces. It doesn't have to be super brown like when making a good French stew but it does need to be brown. When all the meat is browned add the onions. Cook until soft and well browned, about 10 minutes. Regulate the heat so the onions don't burn. Reduce heat to medium low. Move the onions to the outer edges and add a splash of oil. Add the whole spices (cloves, cardamom, cinnamon and bay) and cook about 30 seconds. Leaving the onions on the edge, add the spice mix. Cook for around 90 seconds, stirring constantly. You want enough oil to keep everything wet. If it looks dry, add a Tbsp or two of vegetable oil. Mix in the garlic ginger paste and cook another 30 seconds or so. Return the meat and accumulated juices and scrape up any browned bits in the bottom of the pot. Now mix in the yoghurt one Tbsp at a time. Stir it in before adding the next one. I don't know why this is important but Madhur Jaffrey says so. I still do it. It has never gone wrong. Probably, it doesn't make any difference but, well, Madhur says so and who am I to differ. Now add a big tsp of salt with enough water to almost cover the meat. Cover and place in the pre-heated oven. Cook until the meat is tender, about 2-2 1/2 hours. Give it a stir every 30 minutes. When the beef is tender remove the pot from the oven and place over medium low heat. If the curry is dry, add a bit of water. If it's wet, simmer uncovered to reduce. You want the sauce to be the consistency of heavy cream. Let stand a couple minutes to allow the oil to separate. Spoon it off carefully. You should get nearly all your 1/2 cup of oil back. If you don't mind the calories though, leave some of it in the curry. That oil is loaded with spice flavour. Adjust salt and add the cherry tomatoes. Simmer for about 5 minutes. The tomatoes aren't necessarily traditional but restaurants add them so I've done the same. Feel free to leave them out if you prefer. Garlic ginger paste recipe can be found here. Indian restaurant spice mix recipe can be found here. In beef, indian, main course, meat. Bookmark the permalink. Hi the recipe doesn’t say when to add the cardamom in? Thank you for pointing that out! I’ve corrected the recipe. Appreciate the heads up.